It's a fact of life that at times our digestive tract is not going to agree with us. Thankfully doTERRA has an incredible like of products that support healthy digestion! Today I am going to show you some of my favorite doTERRA products that are specific to the DigestZen line and next week I will show you even more amazing products doTERRA has that support digestion. 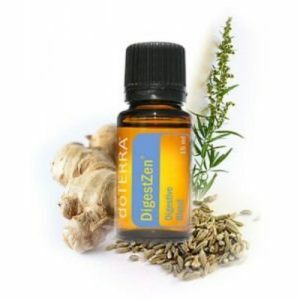 DigestZen is made up of Ginger Root, Peppermint Plant, Caraway Seed, Coriander Seed, Anise Seed, Tarragon Plant, and Fennel Seed essential oils. It is great for helping our bodies digest food, can soothe occasional upset stomach and even helps to reduce bloating, gas and occasional indigestion. Here are some really easy ways to use this essential oil blend. I personally don't love the taste of this essential oil so I love the convenience of having it the soft gel form. The soft gels are simply pre made capsules that have approximately 5 drops of DigestZen Essential Oil Blend right in there. You simply take one and I swear within 5-10 minutes I feel an improvement. Have small kids? The DigestZen Touch roller bottle is perfect for you. When their stomachs are not feeling well you can simply roll this blend on and give them a little belly rub. It is pre diluted so it safe for the whole family. Do you ever deal with occasional indigestion? The Digest Tabs would be great for you. They are an all natural ant-acid. Simply take one and chew it up when you are experiencing these issues. They work great!